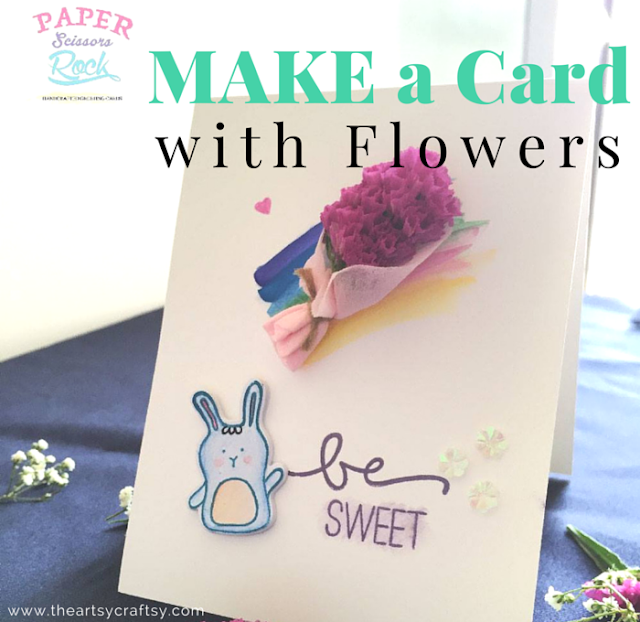 Who would've thought that real flowers can be used to beautify a card in a card making process. Now you have a reason not to throw away any of the leftover flowers that came with the bouquet. I'm a huge fan of flowers! I am quite fortunate to say that I'm not allergic to flowers at all. Being a flower fanatic, I decided to come up with an idea of using real flowers in card making. 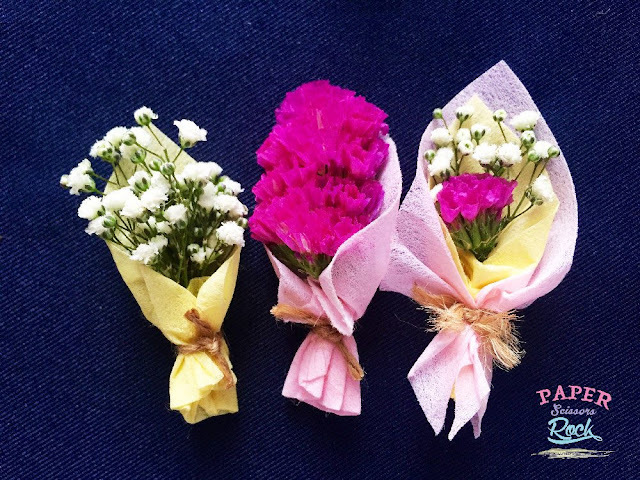 When it comes to choosing your flowers, make sure you choose the ones that does not stain when they wilt/die. It has to be a type of flower that still has its qualities remained even after it has dried up. For instance, baby's breath and forget-me-not is a good choice! 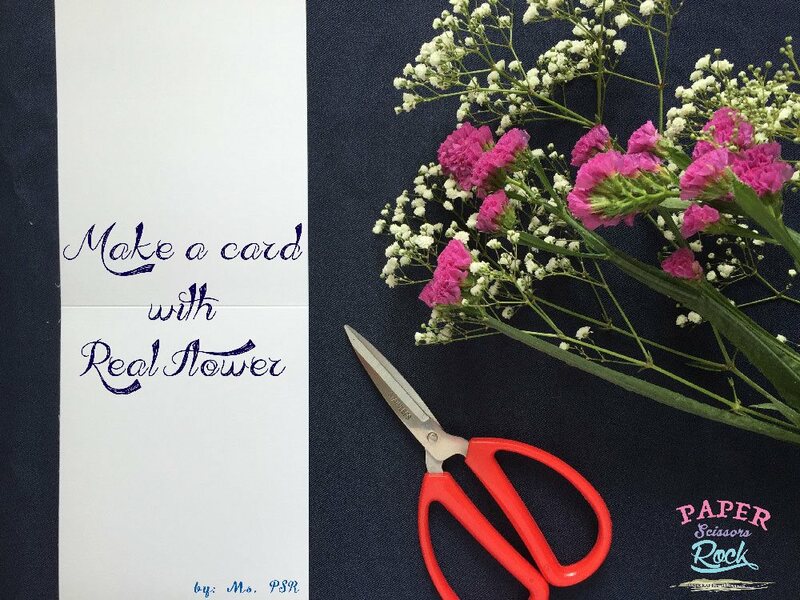 Once you have selected the flowers, cut out the branches. 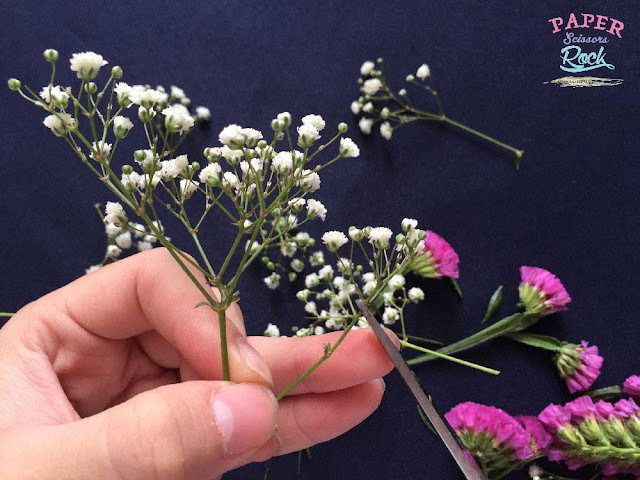 If you are unsure where or how to cut it, imagine that you are making a small bouquet of flowers and the tiny flowers you are holding are big stalks. Prepare a cotton wrapping paper in the size of 2.5' x 2.5'. 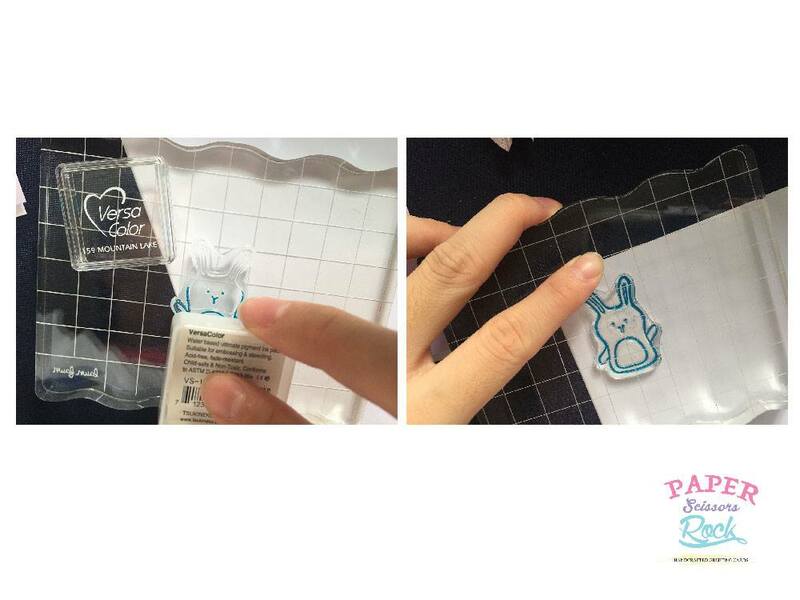 You may also replace the paper with an origami paper or any craft paper that you think is nice or suitable. 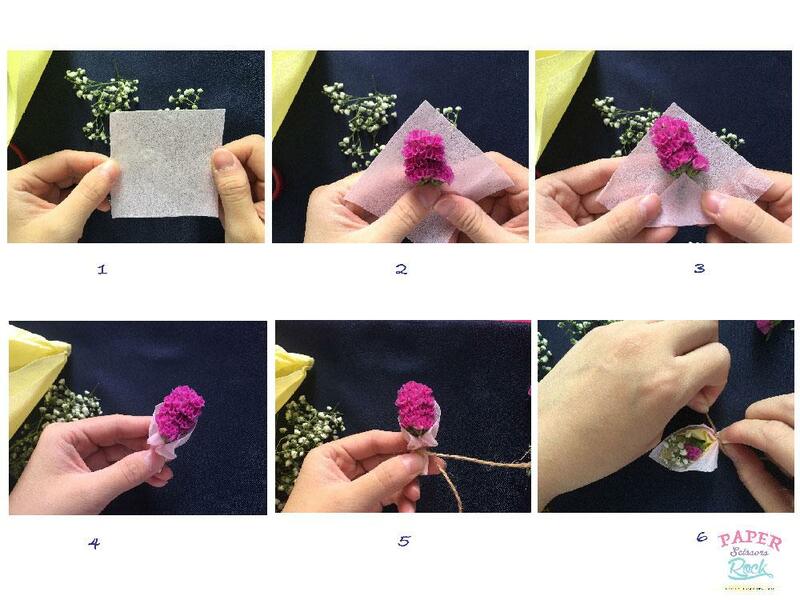 Wrap it up and once you're happy with the look, tie it with a hemp cord to secure the bouquet. Now you are done! While I was at it, I couldn't help making 3 different designs. Which one do you like? Now, onward with the stamping! 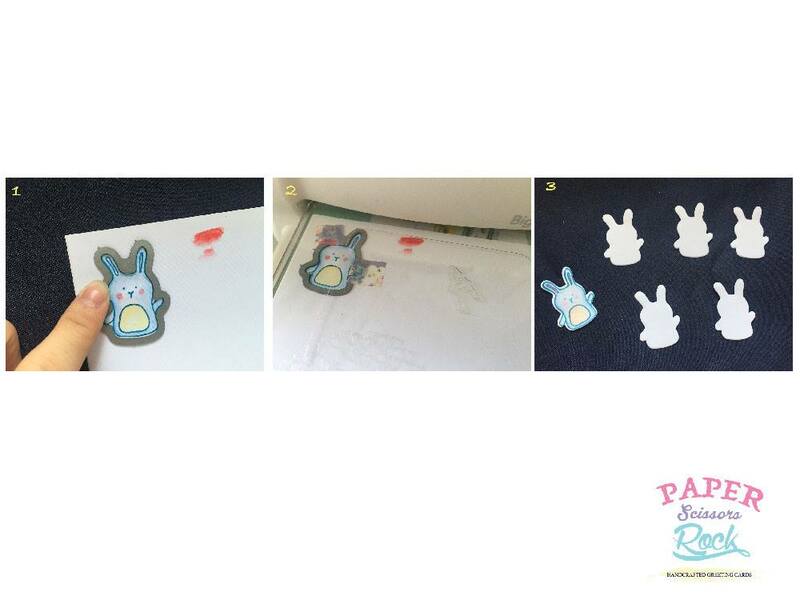 For this project, I am using the Simon Says Stamp - Baby Party Animals Set with their coordinated dies. Instead of using ordinary black colour, you may use a VersaColor 159 Mountain Lake stamp ink. Next, scribble the stamp image with a water colour pencil. 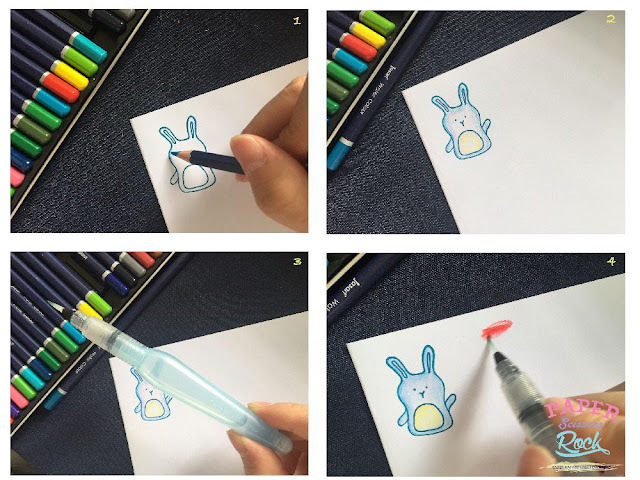 Then use a Pentel water brush to wet and blend it. I also gave it a tiny hint of red hue by blending a red colour at the side of the image and pick it up to install on the cheek! 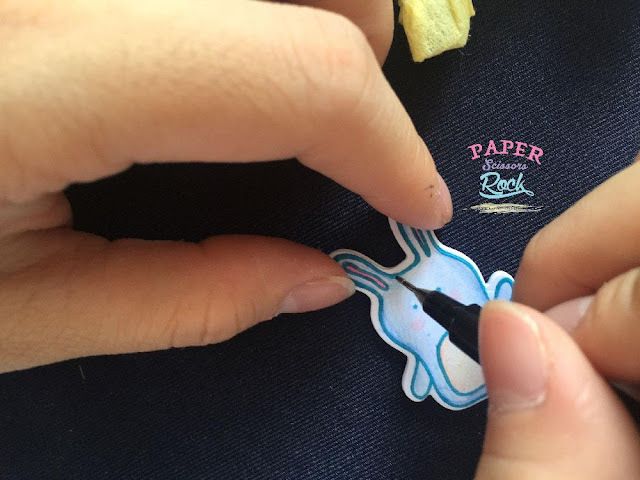 Once you are done with dressing up your bunny, you can proceed with cutting. 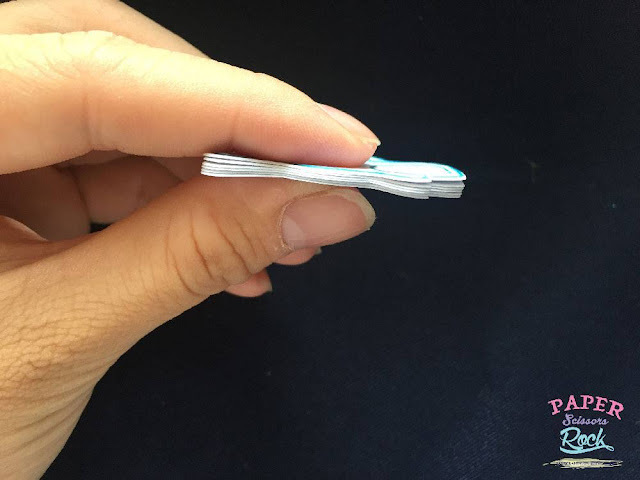 I used a multi-purpose die cutting system called Sizzix-BIG SHOT for a perfect cut. To give the bunny a thicker feel, I have die-cut additional 5 bunnies. Now you glue them together, and it should look like this. Go on and give the poor bald bunny a couple of strands of hair. Haha! 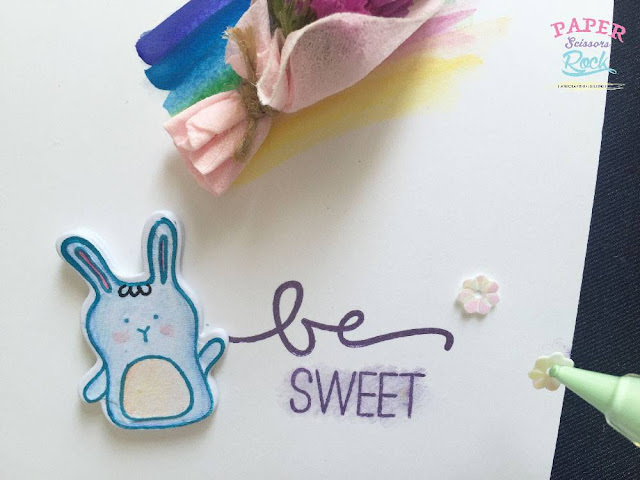 I used Simon Says Stamp BE for the word 'BE', and combining it with Echo Park Paper Co. Everyday Sentiments Stamp for the word 'SWEET'. As for the ink colour, I used an ENCORE metallic Purple ink pad. This is how it should look like once you have put it together! 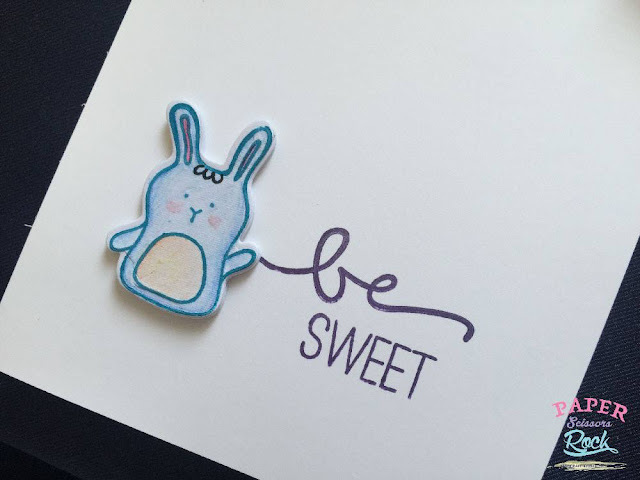 BE SWEET! If you find it too plain and simple, you can decorate it with some patterns or doodles with watercolour. 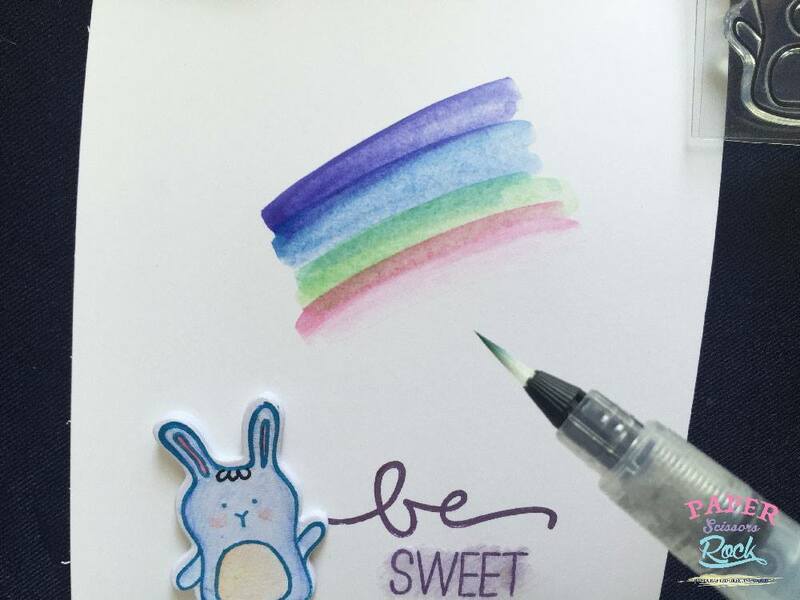 Last but not least, adding these rainbow white embellishment with my Quick Stik tool. There you go! 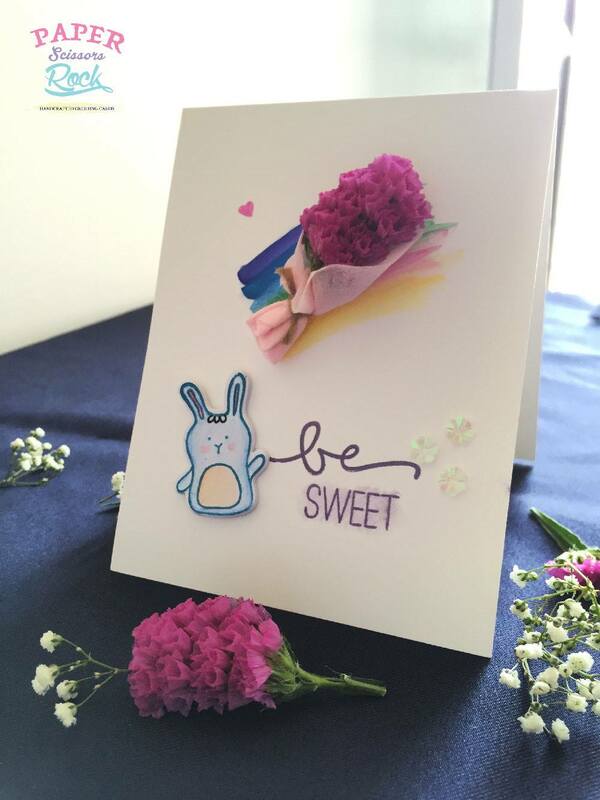 A simple yet sweet bouquet card of flowers for special occasions. This simple card making project idea is great for last minute preparations. 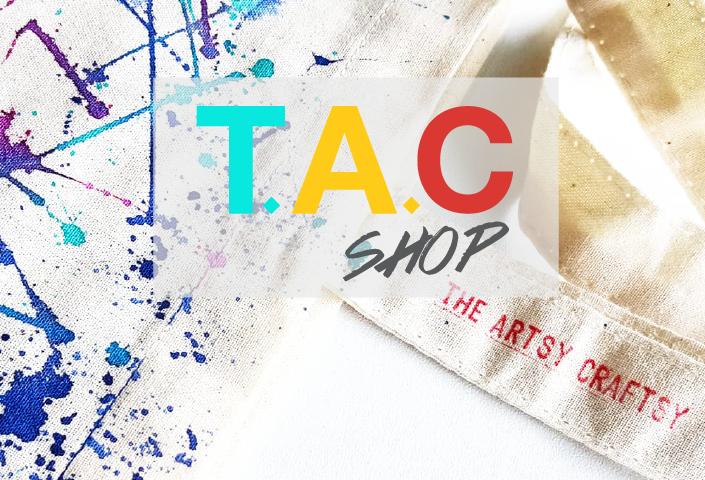 Want to receive a special handmade card from me? Of course you do! 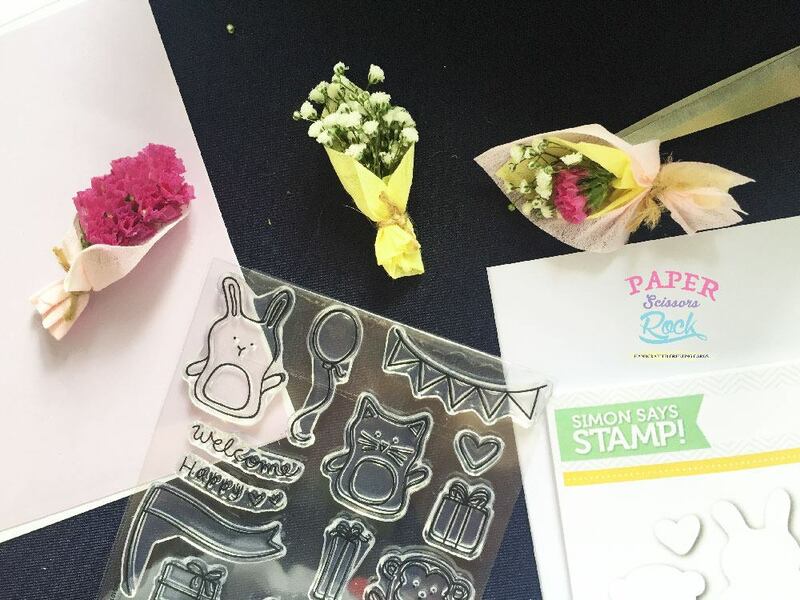 All you need to do is to follow the instructions below to stand a chance to get a card specially made by me for FREE. 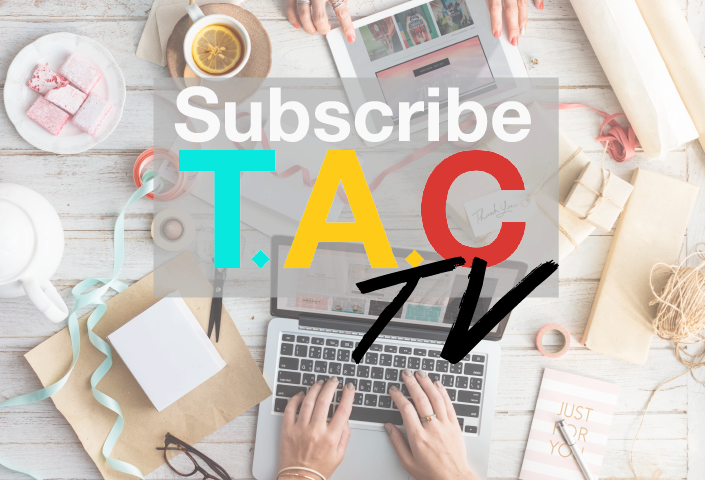 STEP 1: Leave a Comment Below. 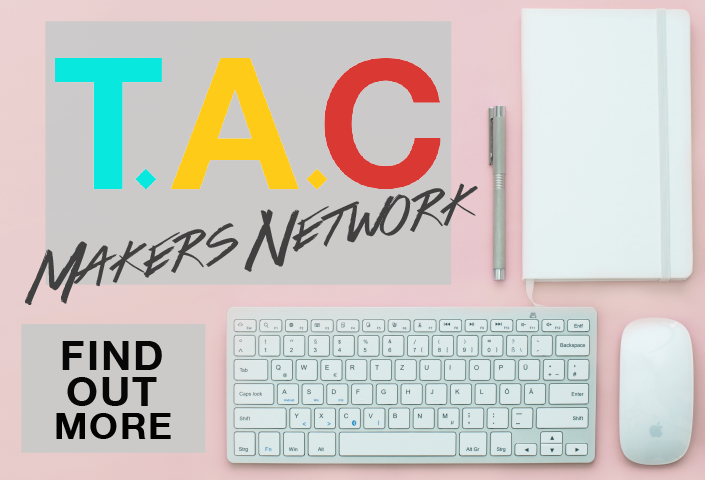 Don't forget to include your email address / Facebook profile link. Done! It is that simple! The card with flowers is so beautiful. Hope can get it. 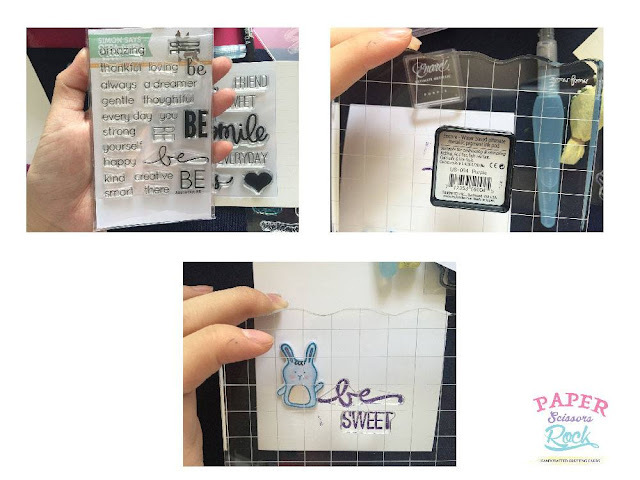 Great idea to do handmade cards full with love (^_^) Definitely going to give a try!